Celeriac is a health giving root vegetable that can be easily put back on the menu. I've been diving into the cookbooks and have come up with several very tasty recipes to make the most of its health benefits. Autumn is definitely upon us (despite the occasional chill sunny day) and with it the desire for soups and heartier warming food. Science says that with less daylight hours, our brains direct us towards eating more substantially to produce the happiness hormone serotonin. I found celeriac for sale recently and was reminded of the delicious remoulade I'd eaten last summer at the Raymond Blanc Gardening School where all lunch ingredients are grown in the kitchen garden. At that time, I'd never tasted celeriac before but enjoyed the blended taste of celery, mustard, mayo and crème fraiche, the main ingredients in remoulade. I didn't think to look for celeriac afterwards but, seeing a pile of these root vegetables in the shops, I bought one with the intention of exploring whether I should be growing this vegetable next year. Putting aside that this supermarket wraps its root vegetables in plastic - (why? when they have to be peeled anyway?) - any veg that's home grown is going to be fresher, organic (I never use pesticides), and seasonal. I often conjure up meals inspired by what I can gather from the garden and anything freshly picked at this time of year is a welcome bonus. Having very little growing space, I have to make sure that whatever I plant will be a good return for my time investment, ie, be tasty, hard to source in the shops, and cheaper to grow myself. And packed with nutrients. Celeriac is from the same plant family as celery so has a similar taste but is the bulbous root rather than the stem. I was amazed to discover that as well as being a good source of carbohydrate, the root has many health benefits to offer. So big tick in the box for that. Useful minerals - phosphorus for healthy bones; potassium for detoxing cells, healthy nerve function (keep those stress levels down! ), efficient muscle contraction and regulating the heartbeat; manganese for development and good metabolism. Useful vitamins: Celeriac is known to be an excellent source of Vitamin C which means that it's also anti-oxidant and anti-cancerous. Vitamin K; good for bone and brain health. Vitamin K improves the body's ability to absorb calcium and who wouldn't want good strong bones to counteract osteoporosis in later life? It's worth noting that 1 cup of celeriac contains 80% of recommended daily intake of vitamin K. More importantly, Vitamin K is fundamental in protecting the nerve endings in our brains which might limit the damage caused by Alzheimer's. I find that a reassuring thought. Low in calories; only 42 cals per 100 grams - useful as part of a weight loss regime. I found that Slimming World have a few recipes using celeriac, including a delicious sounding gratin. Whew! Not bad for a lumpy root vegetable. I'm beginning to like it a lot. Life can be so crazy busy that it's important for me to know that I'm not giving my family empty calories when I serve up dinner. Having a notebook of quick recipes gives me an alternative to microwave ready meals when time is short and ensures that meals are nutritious. Would celeriac be a good fit for my notebook? After a bit of research, it appears the answer is yes. Am I the only person to be unaware of this workhorse winter vegetable? It's beginning to appear so. Celeriac is crisp when raw but is silky smooth when puréed. It can be roasted, sautéed, baked, grated, mashed, pickled or blitzed into soup. You can't do all that with a potato. Celeriac and lentils with hazelnuts and mint is Yotam Ottolenghi's offering. I love that I can use bay, thyme and mint from the herb garden in this recipe, plus lentils are cheap and very nutritious. Whole roast celeriac with coriander seeds - said to be easy and pan scrapingly delicious! Nigel Slater cooks his with milk and adds smoked haddock for a fish soup. Ultimately, I made a soup with my celeriac, following a recipe in Anna Jones' book 'A Modern Way to Eat'. One ingredient was butter beans to give the soup a creamy texture. It was nice. But that's hardly the hearty recommendation, is it! For me, the soup was too thick but the flavour was good, especially topped with chopped toasted hazelnuts, a trick that I've adopted with my favourite cauliflower soup. Next time, I'll add more milk to the recipe, or make Mark Hix's celeriac and apple soup. At the start of writing this post, I was sceptical of growing celeriac for myself. As with leeks and onions, with one seed you get one root so it's not exactly a space saving veg for the small garden, especially if they can be found locally in the shops. But now I'd say to give it a go; celeriac is obviously a versatile ingredient and will provide fresh vegetables at the onset of winter. The seeds need to be started around March, sown onto good seed compost and left uncovered as they need light to germinate. Keep at an even temperature between 15°-18°C (60°-65°F) as they don't like extreme cold. Prick out the seedlings into modules as soon as they're big enough to handle to minimise root disturbance. By pricking out at an early stage, this should stop them bolting later on. Grow on under cover or indoors until they're about 10cm (4 inches) tall. Plant out after danger of frost has passed but grow under mesh or horticultural fleece to thwart celery leaf miner attacking the young plants. Some sort of slug prevention would also be useful; I use Strulch. If planting in the square foot method, put only one plant into one square, or nine to a square metre bed. Celeriac prefers humus rich, well manured soil - the no dig method is perfect for this. Keep the soil moist in a dry summer by watering well as celeriac is shallow rooted and won't bulk up if it dries out. 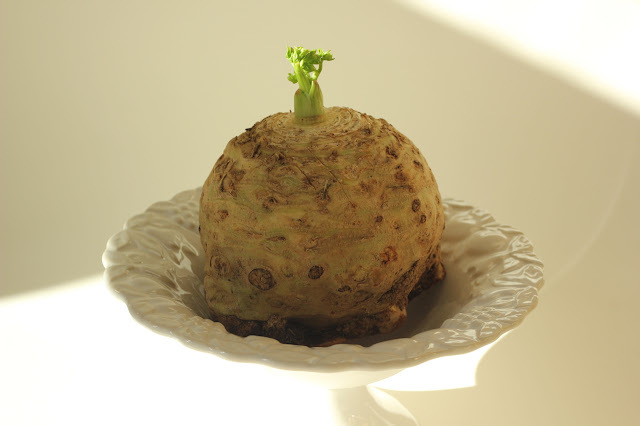 As the celeriac grows, remove the outer leaves to expose the crown of the bulb and encourage it to develop. Harvest is usually from October onwards; grower's choice whether to dig up when needed, leaving the remaining bulbs in the ground - or, if there's a slug problem, harvesting all at the same time and storing in boxes in a cool place. In conclusion, I'd say celeriac will be a useful addition to the autumn veg patch and I'll be sourcing seeds for next year but limit the amount I grow. If I close my eyes, I can picture that tray of roasted celeriac with coriander seeds (recipe above) being brought to the Christmas table alongside sprouts with bacon, maple glazed carrots and a fragrant herb stuffed bird. Sounds delicious? Particularly when most of that produce is home grown! I have just read your blog about celeriac, one of my favourite vegetables. It's also good raw. Slice thinly and add to a crunchy winter slaw or cut into small batons.The seedlings are tiny when they germinate. I work as a volunteer gardener in the kitchen garden at a large house and was asked one day to transplant celeriac seedlings. I could hardly see them! But they went on to produce the vegetable we all know and love. It needs plenty of water to grow to a good size. I have never tried growing celeriac, and have no idea how about the taste. Hi Endah, the taste is like a cross between stem celery - a fresh, green, crisp stem -and walnuts. The closest translation I could find is 'seledri' - perhaps you already know of celery stem? This bulb like root is very similar in taste. Hope this helps! Love celeriac. First made celeriac gratin it when I was working at Thyme Cookery School in Gloucestershire. It's now become a staple for christmas day or special family Sunday roasts. It's also a meal in itself. Fantastic!! Hi Joff, thanks for commenting - I see from your bio that you've worked in some fabulous gardens, including with RB at Le Manoir. I love gratin, usually making it with potatoes but have now bought another celeriac to make that dish. I'm definitely growing it next year - is there a particular variety that you'd recommend? Haven't grown it for a few years. We always grew Giant Prague planted over a trench of manure/compost. There may be better modern cultivars worth a try however. I've earmarked Giant Prague for next year, Joff, as found in Real Seeds online catalogue. No doubt winter reading will bring more choice to light though! Yes, I'm aware that celery doesn't appeal to everyone. I grew up with Waldorf Salad so absolutely love the taste but a friend is not a fan and was so allergic to it that he had to be hospitalised for anaphylactic shock! Who'd have thought a vegetable would be so dangerous! I grew two celeriac in an old Council recycling box this year. Celeriac and fennel soup is THE most delicious, but I don't have bulb fennel this year so am going to make celeriac and carrot soup, which sounds good and maybe celeriac and chestnut soup with the other. I love the sound of your soup suggestions, Belinda, particularly with fennel, yum! If you're not allergic to nuts, try crushed hazelnuts and pumpkin seeds on the top of the soup; the extra crunch is lovely and adds to the nutrition. Really motivational to know that you successfully grew celeriac in a green bin - I have a couple of those that I used for carrots last year but they may be hard to source now. Now that looks as fat as a Christmas pud! I was interested in your post because I have repeatedly tried, and failed to produce a reasonably sized celeriac. This year has been the best but tennis ball sized would be overstating it. Being stubborn I will be trying again next year! Hi Mal, That's exactly what I was reminded of, haha! How to glam up your root veg for blogging! I'll be growing celeriac for the first time next year and charting my progress. I think the dry conditions last summer may have hindered growth in a lot of veg, especially if shallow rooted. I found some good growing tips so I'll be referring back to these in March - Let's compare notes next year! As a veggie, I'm quite familiar with celeriac. It makes a good mash, either on its own, or mixed with potato, or other root veg. One day, when I've got a veg patch, I'll grow my own! I’ve tried growing celeriac but I just can’t get them to grow. I assume that the seeds germinate and start to grow for you, Sue, so do you think the problem is with the soil? Or lack of water? I must admit I would never have thought of removing the outer leaves unless I'd come across that tip. Sounds like I might have a challenge on my hands growing it next year! Will you be trying again? The roots just don’t swell. We have the same problem with swedes. It could be a soil issue, we do avoid using manure. I don’t know whether we will try again, maybe leaf removal is the key. See Joff's reply above, Sue. Sounds like a trench of well rotted manure - or good home made compost - could be the answer. They're obviously hungry plants!